Joe Flacco has a lot of work to do if he is to erase his lasting legacy with Broncos fans. Will a Super Bowl do it? Not if you believe losing is more profoundly painful than winning is joyful. It’s astounding he’s now the Denver starting quarterback after his Flacco Fling in a 2012 season playoff game broke the hearts of the entire Rocky Mountain region and Bronco fans everywhere. “Who would’ve thought?" Flacco said to start his interview Friday morning with 9News. He delivered one of the two-most demoralizing defeats in Broncos history. In a second-round playoff game played on a frigid, 2-degree windchill Sunday afternoon in January at whatever they were calling the stadium at Mile High, the Broncos were leading, 35-28 with 41 seconds remaining. 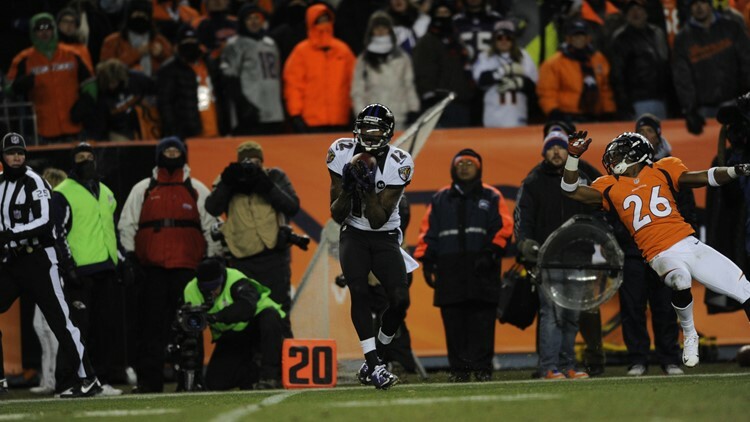 Flacco’s Baltimore Ravens were backed up to their own 30. Sorry about this Broncos fans, but I asked Flacco to review what happened next. “Yeah, why are you doing that?" he said with a smile. Against a three-man rush that became part of second-guess lore, Flacco stepped up in the pocket, wound up and heaved a sky-high pass down the right sideline. Broncos safety Rahim Moore misjudged the ball and stumbled backwards as the pass landed in the arms of receiver Jacoby Jones, who took it in for a 70-yard game-tying touchdown. It took 10 seconds. Broncos head coach John Fox kneeled out the final 31 seconds of regulation and the Ravens won it on a field goal in double overtime. Only the Broncos’ playoff loss to the upstart Jacksonville Jaguars in the 1996 season can match their excruciating defeat 16 years later to the Ravens. Flacco went on to carry the Ravens to the Super Bowl XLVII title. Even with what he did to become the Super Bowl MVP, was the Flacco Fling to Jacoby Jones the single biggest pass play of his career? “There’s no doubt," he said. “Off the top of my head it’s impossible not to put that in there." He was pressed again to describe it. “It was one of those things where you get lucky through the whole situation," he said. “I think I had taken a sack, or maybe a 1-yard gain the play before. “Everybody was kind of scrambling around and maybe not aware of the situation of the game. I was hoping I didn’t get the ball stripped from me as I reared back to throw because there was a guy next to me. I had to step up a little bit. And a little bit of luck goes a long way." Proof that Flacco doesn’t dwell in his own glory, he didn’t take a sack the play before – he had scrambled forward for 7 yards to bring up third and three at his own 30. Elvis Dumervil, who would become his teammate the next year in Baltimore following the infamous Fax Fiasco, and Robert Ayers were the two Broncos pass rushers Flacco split as he stepped up in the pocket for his throw. Six years later, the wound has healed if not completely, and Flacco was traded to the Broncos for a fourth-round pick. Both the quarterback and his new team need each other as neither has won in recent years as they did during an earlier stretch. “I couldn’t be more excited," he said. “You don’t know where you’re going to go, you don’t know where you’re going to end up. It wasn’t really in my control. If I had control I don’t think I would have it any other way." 9News had reported from the moment the Broncos’ disappointing 2018 season ended that the team would go forward with either Flacco, Foles or a first-round pick as their quarterback heading into the 2019 season. Broncos general manager John Elway wound up taking Flacco instead of Nick Foles or partnering incumbent quarterback Case Keenum with a first-round rookie. Flacco is here while Keenum was traded away to Washington. After growing up in New Jersey, and playing for Delaware and Baltimore, would Flacco have considered the move to Denver had he been released to free agency instead of traded? “I would have loved to have landed in Denver, even if I was a free agent," Flacco said. “Just what Vic (Fangio, the Broncos’ new head coach) brings and the type of offense that I know we’re going to run out here. It is one of the places I was for sure looking at." About midseason, as the Broncos began plotting their moves, one of their schemes was to possibly make Flacco and Gary Kubiak a package deal. Kubiak was Flacco’s offensive coordinator in 2014. Flacco and the Ravens had a good year, going 10-6, winning a playoff game, and nearly beating the eventual champion New England Patriots in the second round. The idea was for Kubiak to return as the Broncos’ offensive coordinator while Flacco would somehow make his way here. But after Fangio was hired as head coach, plans changed. Kubiak surprisingly broke up with Elway and the Broncos over a disagreement on coaching assistants. But the Flacco part of the plan was still executed. Kubiak took his coaching assistants to Minnesota. “Yeah, once that fell through I was like, man, that’s going to – I was kind of bummed out for a couple days thinking my chances of coming here were going to be gone," Flacco said. “But getting a younger guy that runs a similar branch of that offense -- I still hadn’t reconsidered this might be the place but when it happened? I was really excited about it. “And just a little bit breeze through the offense, there’s a lot of familiarity with it that I have from ’14 and I’m really excited about it." The younger guy is Rich Scangarello, the Broncos’ rookie offensive coordinator. He spent the past two years as Kyle Shanahan’s quarterback coach in San Francisco. Kyle Shanahan was Kubiak’s offensive coordinator in Houston. Elway picked Flacco over Nick Foles in large part because of the former’s success playing under center in the Kubiak offense in 2014. Foles is more a shotgun quarterback. “In 2014 I was under center a lot. I think Kyle had his quarterbacks in the gun a little bit more and Rich came from that but obviously the ability to be under there and do the play-action stuff is going to come in handy." There is Joe Flacco the quarterback. And there is Joe Flacco the husband and father. He and his wife Dana, who attended his introductory press conference here Friday, have five children – Stephen, 6; Daniel, 5; Francis, 3; Evelyn, 2 and Thomas, 11 months. The Flacco Family is moving West. “Yeah, of course," he said. “They’re all coming out. That’s the beauty of having a wife who’s willing to lug them around and do the dirty work. She’s going to be putting up with this for the next few months here." At 34 years old and with three years left on his contract, Flacco could have kept his family back in his Baltimore-area home while he lived here in temporary quarters. Instead, moving the family to Denver shows he’s all in with the Broncos. “Are you kidding me? Wherever I am, they are," he said. “And they’re all in. They all have their (Broncos) hats and they’re ready to go."